Identifying a need in the community for expert and dependable septic tank services, George Gray formed the George B. Gray Company in 1929. After returning from his tour of duty during World War II, George’s brother Robert joined forces with him and together they renamed the company Gray Brothers. In 2013 Amy Gray and her husband Dan Spracklin took over as managing owner/directors, with Amy Spracklin (Gray) as owner and Dan serving as CEO of the company. For this month’s Spotlight we spoke with Dan Spracklin, of Gray Brothers. Septic Services, Paoli, PA.
Q: Can you tell me a little bit about your background? Can you say a few words about your education and training? Why did you get into the septic tank and other related businesses and services? What did you do before you started your own business? How does what you did before you started your own business inform and influence your current business in the liquid waste industry? Before becoming CEO of Gray Brothers I had a successful career in the financial services and insurance industries. I worked as a business architect, bringing people, processes, and technology together to form thriving organizations and teams. In 2009 Amy and I married. Amy, a fourth-generation Gray, grew up her whole life in the liquid waste industry, working alongside her family during summers and breaks throughout high-school and college. With Amy’s intimate and thorough knowledge of the business, and my background in designing successful business organizations, we joined forces and in 2013 we consolidated ownership of the company. Right now Amy is devoted to raising our three children, all under the age of seven, in addition to handling our marketing and accounting needs. Once our little ones have grown, Amy will resume her full-time management role. Q: Please tell me a little bit about the history of your company—when it started, who worked there? What changes or modifications have you made since you took over. Gray Brothers has been in steady and successful operation since 1929, that’s over 85 years of serving the Main Line area of Philadelphia, famed for its many mansions owned by the wealthy elite, especially during its heyday during the 1920s-1950s, and other near-by areas and counties. And, today, we are still located at the same spot that George first opened up his business 87 years later. In fact, on the office wall you can find the original papers and documents for George’s purchase of his first pumper truck for $500, as well as an official Government permit, issued during WW II, that gave the original Gray Bros the right to use fuel during the war. Over those many years of serving the same community, Gray Brothers built a rock-solid reputation, based on expertise and honesty, which spread wide largely through word-of-mouth and recommendations from former and present customers. That great reputation and seasoned longevity paid off in the long run because nowadays we work from a client-base of over 20,000 loyal customers. Q: What is your business model? How have you structured your business? What plans, models, or organizations, configurations, did you envision when you thought about how you wanted to set up your business structure? First, in terms of services and equipment you thought you wanted and needed and second, in terms of employee base. What market research did you do, if any, to help you make decisions on your business model and the types of trucks and equipment you thought you needed when you started? When we incorporated in 2013, the first step was to fully-modernize the company, and bring it into the digital age, so to speak. With my successful background in analyzing and designing management systems and company structures, it was a real treat, and challenge, for me, to be able to build on and work for such a company. Our goals were to standardize and streamline the company operations, so as to substantially increase productivity. For example, we were able to become just as profitable working with 4 pumper trucks and 4 drivers, as previously they had to use 5 trucks and drivers. We did this by continually improving the processes by using and applying verified business management methodologies that corporate American has been using with great success, such as Six Sigma, Total Quality Management (TQM), and lean management policies and practices. Some of the characteristics of such business models are to eliminate defects and redundancies, and reconfigure the way things operated. For example, in streamlining the way we process work orders and the way drivers are routed, and applying economies of scale, we were able to land much bigger contracts with our commercial and industrial clientele, as well as increase efficiency, productivity and, ultimately, revenue. Q: Tell us about all of the different services that you offer. Which division is the most successful? Why do you think that is the case? What is the breakdown, in percentages of each division, and the work you do with each? Gray Brothers is a complete full-service septic system operation, involved in everything and anything having to do with septic systems, from designs and installations, to inspections, and servicing. 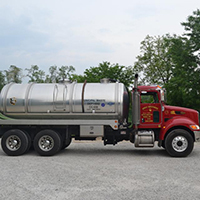 We are currently one of the few liquid waste businesses in the area who offer a full menu of items, a full-service septic operation. It has always been that way and so, Gray Brothers have had over 85 years to perfect their skills and expertise and become master craftsmen and technicians. I would say that about 70% of our business deals primarily with pumping and servicing, which breaks down to about 85% residential and 15% industrial/commercial, a good 20% of the business is septic system installations, and another 10% going to inspections to round it out. Pumping and servicing, the core of Gray Brothers since the beginning is naturally our strongest division, especially due to the development of such a strong business brand over all the years. For example, we have been pumping and servicing the same homes for decades, even after they have changed hands and ownership. Q: What are some of the distinguishing features and services of your company that are unique and that no other local company has, so that you can deliver the greatest value to customers at a price-point cost comparable to, or lower than, your competition? How did/do you arrive at creating a unique image or identity for your company? What are points of differences to how you work with your target client base, differences that make your company stand out? We always strive to offer superior quality and septic tank expertise at a fair price. The average tenure of our employees is 10-15 years, and some of our employees work or worked for the company for 20, 30+ years. They are some of the most loyal and dedicated workers around. One of our family of employees, who recently retired, worked for the company for over 45 years; another worked for the company for over 52 years. Over the years we have created a Wall of Fame where employees who work for the company for 25 years have their time-card retired, just like they do to professional sports players when they retire their jersey numbers. This longevity goes for all divisions of the company, from field technicians to administrators who work in our office. That adds up to 100+ years of combined experience, knowledge, and development, and when it comes to septic tank systems on the Main Line in Philadelphia, few companies can offer as much to their clients. Over the years we have had many opportunities to expand into other aspects of the industry, but we made a conscious choice to stick with one thing—septic systems, and refine our knowledge and expertise. This is because a loyal customer will recommend our services to the new homeowner, who then hires us to be their go-to septic system expert. All we had to do was maintain, and increase, the superior customer service and technical expertise that our Philadelphia Main Line customers have come to know and expect from Gray Brothers. For example, just the other day a customer of ours called to thank us. It seems that both he and his neighbor had septic systems installed 6 years prior, but the neighbor’s system failed and it had to be replaced, whereas the one we installed was running fine. Q: How do you identify and respond to existing/new market segments that provide the best opportunities for growth and why? Tell us about the company’s growth model. What growth potential do you see for your business; for each division of your company? What is your target growth percentage? Are there times when you do not reach or you exceed it? What are the factors, do you think, that contribute to the growth or non-growth of the company, of each division? Are there patterns of business and financial growth and development that you have recognized? What problems have you faced, and how have you handled them. Because of the close ties to the community that Gray Brothers established and cultivated over the decades, today, we enjoy close to 90% of the liquid waste market share in the areas in which we operate. Our growth has been solid and steady, and we expect a solid 5% annual growth over the next five years. Projections suggest that three out of every five homes in the near future will be built with, or need, on-site septic systems. 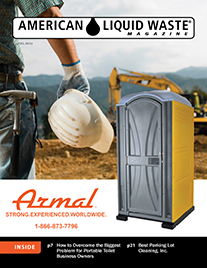 By paying close attention to local, regional, and national market trends and developments, we can gear up and set plans in action to grow the company along with the growing needs along the Main Line and other suburbs of Philadelphia, for septic system installation, servicing, and inspections. Over the next few years our expansion plans include a few acquisitions—local septic companies whose owners are aging out with no line of succession. Over the decades we have always remained in good, friendly contact with our competitors and so the acquisitions will be smooth turnovers while Gray Brothers substantially expands its operations. Q: I am interested in all of the employees that work for the company. Who works at the company? How many employees? What are their titles (managers, administrative, drivers, truck mechanics, technicians, etc)? How is your managerial and employee structure organized and implemented? Altogether, 14 people work at Gray Brothers. We have 4-5 full-time drivers and technicians, all of them having grown into their present positions by starting out as laborers and learning the ropes and having years of continuous training on all aspects of the service side of the business. Technically, there is no formal school or degree for septic tank work, and so our drivers and technicians have all had apprenticeships and now long term tenure with the company. We have two full-time office staff employees. Our dispatcher has 25 prior years working as a driver and technician for the company, and so he brings a wealth of knowledge to the table, which he can share with the drivers as well as anybody that calls in about a problem they have with their system, or wants to know how the whole process works. Our two installers are seasoned experts with a combined 70 years of experience installing septic systems in the areas that Gray Brothers have served for so long. Together they have installed an amazing 1,000 different septic systems. They are definitely master craftsmen, who pass on their wealth of knowledge to the younger members of our team. Gary Gray also still contributes as a top consultant to the company. When either homeowners or workers cannot locate the underground septic system, for example, we call on Gary, who is good at locating systems. Together with Gary, I am responsible for most of the systems’ designs and overseeing new systems’ installations. We have four, soon to be five, excellent PSMA-certified inspectors. The backbone of our operations is Bari Harvey, VP of operations, who manages all of our the day-to-day operations, everything from the scheduling, to the ordering of all of the equipment parts, etc. Before joining us at Gray Brothers, Bari had over 20 years of experience as a former president of a large construction firm. Finally, we employ two-three laborers, who are in apprenticeship and training to become the next generation of installers, drivers, and technicians. Q: How do you boost efficiency in your jobs and your workers? How do you boost morale in your workers? What do you expect of them? Who trains them? Being in business for over 80 years, with almost all of our employees working with us 10 years or longer, it is natural that we have really become one big family. Our employees tell us they would never want to work for another company. Since our employees have been so loyal and do an excellent job, we try to return the same loyalty and respect. We provide them with the best, most functional equipment, as well as, for example, providing them all with the needed winter clothing to keep them warm while out in the field. There is also the popular break area complete with operational kitchen. It is a place for our employees to congregate, have fun, cook or eat snacks, meals, etc. Q: Tell us about the different trucks and other equipment we would see if we looked in Gray Brother’s on-premise garage. We operate with a fleet of five pumper trucks. Three of our trucks are 348-model Peterbilt. Two have a 4000 gallon aluminum tank and the third is equipped with a 3600 gallon aluminum tank. The Peterbilt trucks have either Masport or NVE pumps. One is automatic the other is an Eaton 10-speed manual. We also have two Sterling trucks, both having 4000 gallon tanks, with one made of carbon steel and the other aluminum. 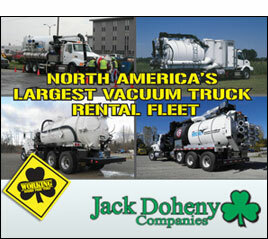 Both Sterling trucks are equipped with NVE pumps. For excavating we operate with three Case 380 Super M backhoes and two Terex PT-70 skid steers. One of our dump trucks is a tri-axle Ford L 9000 and the other is a single-axle Chevy Kodiak. In addition, we operate a fleet of maintenance and assistance vehicles, one Ford Transit fully-loaded with parts and accessories that goes from worksite to worksite; and three pick-up trucks, a Dodge 1500, and two Ford F250s. Next year we are planning to purchase two additional excavators, one mini that can fit through gates and into smaller areas, and one midi, which is like the size of a backhoe. For our inspections we use Mytana wireless video-feed camera systems. What we like about these is that we can show our customers the video feed on smart phones, and then upload the video to our YouTube channel so they can become more informed about the work we are doing for them. We use state-of-the-art fleet management software systems that is linked with the GPS devices installed in all of our trucks and vans. There are many good systems but Fleetmatics is your system of choice. Q: We are interested in your client base. How many clients would you say you serviced or pumped annually? Who are some of our bigger and important clients? We pump about 8-9 thousands tanks annually. We also move about 4.2 million gallons of sewage annually. The majority of our clientele are residential. Over the years we have developed good working relationships with 25 different universities in the Greater Philadelphia area. We provide grease trap services to almost all of their kitchen and other food service operations. Plus, many of the Universities own numerous residential homes and with those we provide all of the septic tank services. Our 24-hour emergency service has becoming more popular and growing, with both residential as well as township emergencies. We also have enjoyed good working years with Villanova University’s (Resilient, Innovation, Sustainable, and Engineering (RISE) program. RISE is a conglomeration of University professors and graduate students, doing research for twenty of the top high-tech companies in Philadelphia, including Boeing, Merck, Comcast Cable, etc. that have bi-annual conferences where they discuss ideas, technologies, theories, and best practices. 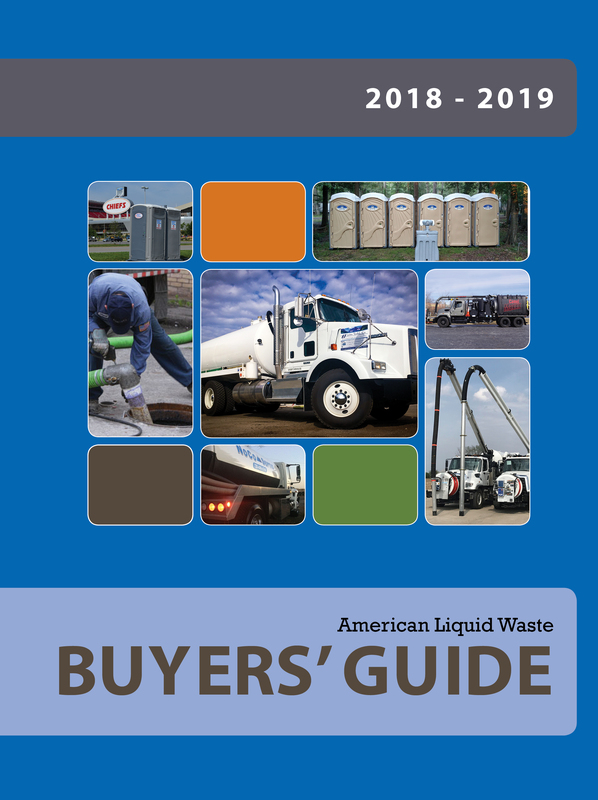 The large companies sponsor research posing and addressing problems in many industries, including liquid waste industry. We provide technical consultancy and help out anyway we can to provide what RISE needs from our end. They also work with us so we can determine what the environmental impact of Gray Brothers is, our carbon footprint so to speak, and implement strategies to consciously work to minimize and reduce it, as part of our working business model. Q: What are the most challenging aspects of your business and industry? What hurdles do you confront and how do you handle them? What strategies do you have in place to successfully find solutions to these challenges? What are your policies and procedures for responding to emergencies your clients may have? Two or three of the more important regular challenges are keeping the equipment in optimal working order, and finding good employees that either have or can develop, a sound education about the work we do in the liquid waste industry. How to attract the right new talent coming up, or the next generation of apprenticeships and masterships, is also very important, and will be more so in the future as the present talent pool in the industry retire, etc. That is something to pay attention to. Also important is to keep a constant eye on new and emerging technologies, especially state-of-the-art septic drain field technologies, and working with local agencies and dealing with the legal system that sometimes takes forever to pass state approval of a new technology. For more information about Gray Brothers, their website address is: http://graybrothersinc.com.